Home: Austin James Associates, Inc.
"Please Note: Current Website is Under Construction." Austin James Associates, Inc. (AJA) is a full service environmental consulting firm headquartered in Pocono Pines, Pennsylvania. Our clientele includes gas station owners/operators, petroleum storage and distribution businesses, industrial companies, resorts, municipal entities, and law firms. We provide professional environmental services including response to new or suspected hydrocarbon releases, initial mitigation measures, site characterization, remedial alternatives evaluation, remedial action plan preperation, pilot testing, design, installation, and implementation of remedial programs at sites impacted by the release of petroleum products, solvents and other hazardous materials. Browse our website to learn more about our environmental services. Contact us by phone, email, fax, or our online questionaire. 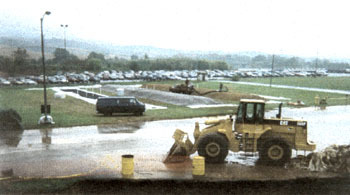 Remediation site using extensive configuration. Remediation site using effective system solution. © 2011 Austin James Associates, Inc.